The Pre-Hispanic City of Chichen-Itza is a large archaeological site built by the Maya civilization. It is located in the northern center of the Yucatán Peninsula, present-day Mexico. 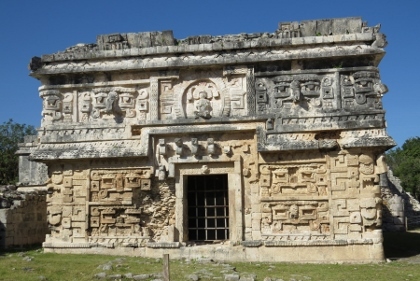 It is one of the most important examples of the Mayan-Toltec civilization in Yucatán. Chichen Itza was a major regional center in the northern Maya lowlands from the Late Classic through the Terminal Classic and into the early portion of the Early Postclassic period. The site exhibits a multitude of architectural styles, from what is called “Mexicanized” and reminiscent of styles seen in central Mexico to the Puuc style found among the Puuc Maya of the northern lowlands. The presence of central Mexican styles was once thought to have been representative of direct migration or even conquest from central Mexico, but most contemporary interpretations view the presence of these non-Maya styles more as the result of cultural diffusion. I stayed overnight at the Mayaland Resort, right next to the archeological site of Chichen Itza. This gives you the advantage to start exploring it from 8 a.m., well before the busloads of tourists arrive from the coast. The resort actually uses another entrance to the site than the main entrance, another bonus to beat the crowds. A handful of other hotel guests and myself made it in at around 8.10 a.m., as we had to wait for the ticket guy to unpack, prepare for the day and wait for his counterpart from the Yucatan state. The entrance fee of 188 pesos (ca. 10 EUR) is split over two authorities, so you have to pay twice when you get in and this means two jobs for ticket sellers too. The process is a bit cumbersome for a site that is as highly visited as this one, as is the use of odd numbers for the entrance fee (it’s actually 49 + 129, so you pay 50 and get 1 back, and then pay 130/150 and get change from that too). Then follows just a short stroll to the main “plaza” of Chichen Itza. Fortunately the slow start at the gate did not mean I had to photoshop the people out of my pictures – maybe a dozen tourists or so were walking around this large area. It felt quiet for the whole first hour or so, and that’s enough to see the central zone. Around 8.30/9.00 the first hawkers were coming in, they are allowed to set up shop along the paths (not next to the monuments). Groups (lots of Germans) were arriving from around 9.30. The Pyramid of Kukulkan (or El Castillo in Spanish) lies in the center of this former city. It’s an iconic building, very perfect in shape. Nowadays you can’t get on or in it anymore. As with all other buildings at Chichen Itza it’s completely fenced off by a rope. No touching is allowed here, what a difference with Calakmul! Probably due to that, or to the fact that some buildings look overly restored or cleaned up, the place felt very sterile to me. It’s a bit like visiting a museum with important and wonderful objects, but without any context. Explanations at the site are very limited, and I needed the map and explanations of my Michelin Green Guide Mexico to find my way around. Michelin does not sponsor me by the way, but I just like their guides and the Mexico copy is excellent in detail yet not too heavy to carry around. What did I see? Well, in 3 hours I managed to visit all buildings at the site. The Great Ball Court is indeed large and makes you wonder how that ball game really worked (the hole in the ring is very small, maybe they used tennis balls?). I also visited the Sacred Cenote, my first cenote in Yucatan. It used to be a Mayan pilgrimage site. And I enjoyed the many fine sculptured decorations at for example the Temple of the Jaguar, the Skull Platform and mostly those at the little Iglesia. Chichen Itza is the most iconic site in the Yucatan Peninsula for a reason—it's memorable. It's also incredibly well preserved and an easy place to wander and begin to understand the Maya civilization. I traveled there once solo, and then on a family road-trip with my nephews and they loved the grand scale of Chichen Itza, it impressed them in a way that nearby Tulum did not. Perhaps it was the shady paths that made it feel more like the ruins of an ancient city, but they could really imagine that this was once a place people lived and worshipped. Most memorable on both visits is the Grand Ball Court. Not only did the acoustics and the story of the sports played there impress me on my first visit, but it was the story that my nephews also most remember in the months and years after our visit. Dating to 600 A.D., the Maya had sometimes brutal games, and guides in Chichen Itza describe that the losers of the most popular game—Pitz—faced decapitation. There's just enough scale and drama at Chichen Itza to captivate even the youngest visitors, and it's an absolute must visit site for any travelers, including families. Since we were on a road-trip of the Yucatan Peninsula, we were seeing a lot of things, but also trying to make each day interesting. One hit was that we went to Cenote Dzitnup after Chichen Itza. It was a hot day and using this as the reward for a morning spent learning was ideal for all involved! It's a gorgeous cenote and everyone had a grand time. I visited this WHS in January 2016. I always wanted to visit Chichen Itza, one of the New 7 Wonders of the World, and I chose to visit it for my 30th birthday and to celebrate my 300th WHS milestone. The absolute highlight and most famous Mayan monument is the Kukulkan Pyramid and I visited at sunset and after sunrise for the best light for photography. Sunset is still crowded when compared to other Mayan sites. The best time for quieter visit is first thing in the morning. I parked my rental car 100 metres away from the parking lot which was still empty when I arrived. That way, I avoided the short queue of cars waiting 8 o'clock sharp for the parker to grant access to the parking lot! Instead I went straight to the ticket booth and at 08:05 I was alone in front of the magnificent Kukulkan Pyramid. Having visited the day before at sunset, I knew that the sun would be facing the other side of the pyramid opposite to the main entrance so I went straight there. I had this side for myself till around 08:25. After I took a zillion pictures I visited the other main structures worth visiting, mainly the altars, the ball court, the observatory, the little iglesia, the sculpted columns, the skull platform and the sacred cenote. By 10:30am I was back to the main entrance (I had spent hours visiting at leisure the day before!) and the queue was never-ending! The parking lot was full of coaches that practically arrive en masse after 10am. So the bottom line is, if possible visit in the late afternoon or better still early in the morning. I visited Chichen Itza after 2 weeks of Mayan temples and I'm glad I left it for last. However, if you expect a 'jungle/forest temple experience' you might be quite disappointed as it is pretty much a 'visual experience' more than anything else. Nonetheless, it is one of the top WHS on the list and definitely visit at least once in your lifetime. 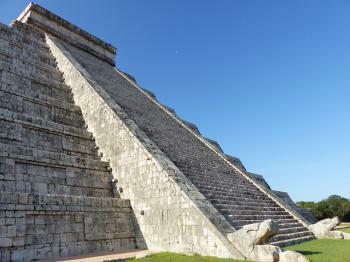 I went to Chichen-Itza on 13.0.1.0.11 [Mayan calendar], or 7th December 2013 [Gregorian calendar]. 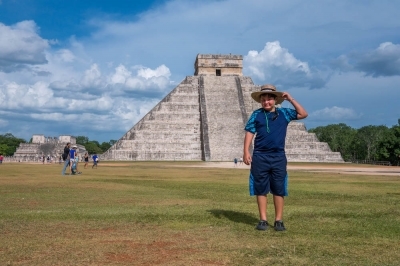 El Castillo at Chichen Itza is one of those sites that – even if its name is not as well-known as the Statue of Liberty, the Taj Mahal or Christ the Redeemer – is instantly recognisable from films and photographs to people the world over. I was fortunate enough to be able to tag along with my Dad (an airline pilot) on a three-day trip to Cancún in Mexico over Christmas, and so we had to take the chance to pop on a bus to Chichen Itza. On the way our bus stopped at a place called Cenote Zaci, which is a combined sinkhole, tequila museum and silver trinket shop, where we got lunch too. After the sinkhole we were driven on to Chichen Itza, where we were told to expect 50,000 other tourists. The guide was, I think, deliberately trying to lower our expectations for some reason. In the event, the site had been quite well managed, so that it did not feel particularly busy at all once inside the ancient city. I was a little skeptical about how real all of the stuff is at Chichen Itza. That is not to say that it has been wholly fabricated, but that some of the buildings and carvings look almost new, and I suspect they may have been subject to some ‘interpretive restoration’ (there are parts places with concrete all over them). Still, it is a wonderfully photogenic place, and some of the facts that sounded too good to be true really did turn out to be true. The ancient Mayan city of Chichen Itza is located in the Yucatan peninsula. The place was the major religious centre of the area. Experts explain the presence of the city on this place by the existence of natural wells (Cenotes) allowing the supply of water in an area where water in a scarce resource. 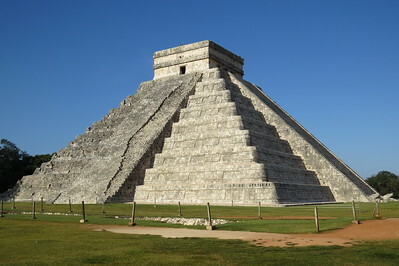 The main elements of the site consist of the great pyramid of Kukulcan (el Castillo), the astronomic observatory (El Caracol), the field in which people were playing a ball game whose stakes were to have the honor of being sacrificed, the sacred Cenote where sacrifices were done and the one-thousand-columns building. The great pyramid, 1000 years old, is 30 meters high and has been designed to create certain effects; for example, on the north-east stairs, the clapping echo becomes a sound looking like the flight of the quetzal (local bird). The total number of steps around the pyramid is 365, which indicate a link with the solar calendar. This pre-Columbian city is a great testimony of Mayan civilization and its people's way of life several millenniums ago. It's a transcendent experience. In 1997 we took the road from Cancun to visit this site. The road was long but interesting with the jungle hugging up against the roadside on both sides. The road just cutting a narrow line through it. I remember it being a straight journey too, no turns or twists. You get there, you park and (then anyways) you really can't see the ruins yet. You have to walk through this trail through the jungle. The whole time you hear rustling on either side of you and you barely catch glimpses of running iguanas. It was wonderful and surreal. Finally the trail ends and the jungles opens up into a massive clearing and there is the grand complex and the huge pyramid looming before you. I will never forget it. When you climb to the top of the pyramid (as you could then) you look around and all you see is green jungle for miles around, forever. The landscape in the Yucatan peninsula is very flat so that beautiful green goes on for what seems like an eternity. Breathtaking. Definately walk the path from the pyramind to the gorgeous cenote at the other end. As your walking it imagine your walking the same steps the priests took centuries before as they made their way to it to drop in their offerings of gold, jewels, and sometimes even a person or two as tokens of veneration to their gods. You just have to see it. Amazing site on he top of the ruin. If you want to visit, avoid the months of June-August...it's very hot and lots of tourist. The culture and the history is quite amazing. Overall, it's a magical place and you should go and see it. Really scary coming down the pyramid, I remember from 10 years ago. The ballcourt should not be missed, nor the acoustics of the court, where you can hear people speaking from a football field away. I visited Chichen Itza on a day tour from Cancun during the summer of 2005. It is extremely hot so remember to bring a hat! After an hour of listening to my guide with two dozen other sweating people, we were given one hour free time to explore on our own. I spent a large part of that hour waiting in line to go inside the pyramid and I must say I was very disappointed. There was nothing to see inside except for a jaguar throne and it was actually hotter inside the pyramid than outside of it! After that disappointed experience, I had just enough time to climb up and down the pyramid before I had to return to the tour bus. Overall, I very much enjoyed my visit and you should definitely go visit it if you are in the area. Passage of the Sun: "El Castillo appears to be oriented so that the west plane of the pyramid faces the "Zenith passage". Thus at the spring and fall equinoxes (and for a week before and after) as the sun sets, a play of light and shadow creates the appearance of a snake that gradually undulates down the stairway of the pyramid. 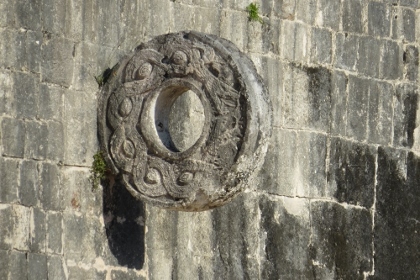 This diamond-backed snake is composed of seven or so triangular shadows, cast by the stepped terraces of the pyramid"
Fusion: "The fusion of Mayan construction techniques with new elements from central Mexico make Chichen-Itza one of the most important examples of the Mayan-Toltec civilization in Yucatán"
Human Sacrifice: There are several locations which appear to be related to Human sacrifice - In particular the "Cenote Sagrado" - from which numerous skeltons have been retrieved. 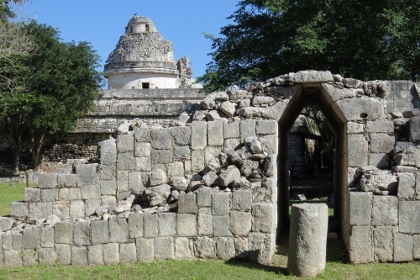 Prophecies: According to Maya chronicles (e.g., the Book of Chilam Balam of Chumayel), Hunac Ceel, ruler of Mayapan, conquered Chichen Itza in the 13th century. Hunac Ceel supposedly prophecized his own rise to power. According to custom at the time, individuals thrown into the Cenote Sagrado were believed to have the power of prophecy if they survived. During one such ceremony, the chronicles state, there were no survivors, so Hunac Ceel leaped into the Cenote Sagrado, and when removed, prophecized his own ascension. Built or owned by Americans: "In 1894 the United States Consul to Yucatán, Edward H. Thompson purchased the Hacienda Chichén, which included the ruins of Chichen Itza." He studied the ruins for 30years before being charged by the Mexican government with theft from the Cenote Sagrado. The lands were seized but returned to his heirs in 1944 and subsequently sold to Mexican owners. 293 Community Members have visited.